Megasmilax is a minor boss in Super Mario RPG: Legend of the Seven Stars. She is found in the pipe in Land's End that leads to Nimbus Land to prevent any intruder from interfering with Valentina's plans to dethrone the royal family. During their search for the sixth Star Piece, Mario and his party comes across Megasmilax and defeats her, freeing access to Nimbus Land. In Super Smash Bros. Ultimate, Megasmilax is mentioned briefly by Viridi during Palutena's Guidance dialogue for Piranha Plant. In addition to be mentioned among regular variations, it is referred to in the plural form in most other languages, implying it is a species rather than a character. The plant originally starts out with a single bud called Smilax. However, after it is defeated, a Shy Away appears and pours recycled water on it, causing two more Smilaxes to grow, and then all three grow back, and finally the large Megasmilax flower blooms with the two remaining Smilaxes. In battle, Megasmilax can cast Petal Blast. The smaller Smilaxes cast Drain and Flame. 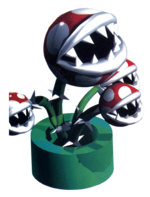 The official artwork of Megasmilax depicts her with three Smilaxes; however, Megasmilax only blooms with two Smilaxes in-game. The stem of Megasmilax has an internal enemy entry known as "Thrax" in the English version and 「クィーンフラワー」 (or "Queen Flower") in the Japanese version. It is possible that the player was originally meant to be able to one-shot Megasmilax before it grows Smilaxes if a character had high enough speed (similar to Naval Piranha from Super Mario World 2: Yoshi's Island), although it was unimplemented unlike Hangin' Shy. This page was last edited on February 14, 2019, at 15:34.